In order to keep you up-to-date with the variety of CAQ AG events throughout the year, here’s a list of all our workshops and trainings. The list also features all the information seminars we host and trade-fairs that we participate in. We look forward to welcoming you to one of our many events. MedtecLIVE is the trade fair for European manufacturers of medical technology. 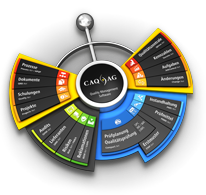 We will be presenting our quality management solutions at the Regulatory Affairs Conference of our partner company MEDAGENT on the 2nd of July 2019 in Tuttlingen, Germany. The Quality Excellence OnSite events allow our customers to see first-hand how our quality management solutions are put into practice by fellow users and learn how the individual modules can assist them in their everyday processes. The event and all presentations will be held in German.